I taught a large variety of courses for undergraduate (general education and majors) and graduate students. I have always been interested in developing new techniques to more actively engage students in the process of science. In majors courses, I used project-based learning techniques, where students work together to solve problems and learn about underlying concepts. 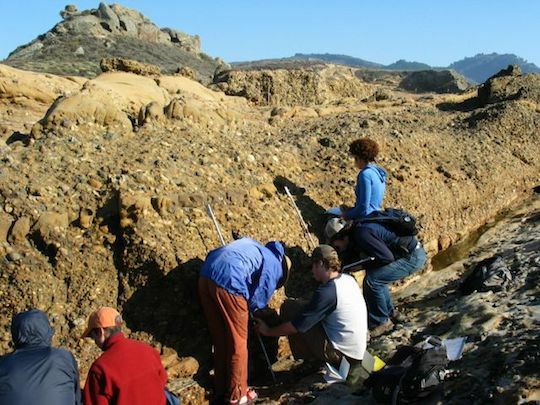 Field excursions are important parts of this process, as are assignments that help students to improve their communication and research skills. The primary majors courses I taught are Introduction to Geologic Techniques (Geol 120) and Sedimentology and Stratigraphy (Geol 460). In general education courses, I used technology to help bring interactively to large-size classrooms. For example, a technique called "just-in-time-teaching" has students complete online homework assignments prior to coming to class. On the "about" page, there is a link to a case-study about this technique that was taped in my Spring 2008 Geol 100 (Introduction to Geology) course. I also taught the Introduction to Oceanography course for many years. Most course materials in recent years are accessible only by the students via a password-protected course management software system. The following links are to oceanography materials that have not been recently updated but that may still be useful to other educators.